The FC-SERIES™ High-Pressure Liquid Pumps were developed by Hydro-Pac early on for applications requiring constant flow at high pressures. These pumps have proven to be exceptionally reliable and many of the original units are still in operation. Standard units are available for discharge pressures of 10,000 to 200,000 psig (70 to 1380 MPa) in frame sizes of 10 and 200 hp (7.5 and 150). Inlet pressure for these units is flooded suction for pressures up to 100,000 psig (700 MPa). Single shot versions and pump test systems are also available. Long slow stroke results in longer packing and check valve life. Pumps can be started under full load without unloading valves. Hydraulically driven intensifiers allow control of both discharge pressure and gas flow rate by controlling the hydraulic drive. This may be important for controlling the pressurization rate for testing applications. Pressure energized seals compensate automatically for wear. Intensifiers are ideally suited for high-pressures due to the simple geometry, slow operating speeds and in-line loads. Small dead volume in the pump cylinders result in high volumetric efficiency. 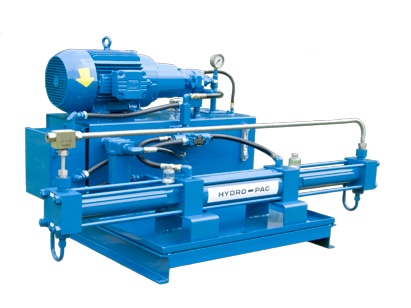 Straightforward arrangement and patented free piston design of Hydro-Pac pumps simplifies maintenance. Reversible valve seats allow use of both sides prior to replacement of the seat.